Examining the structure of Canada’s counter-terrorism capabilities and the Building Resilience Against Terrorism strategy. Canada has evolved through periods of British and French colonialism, autonomous dominion and post-imperial independence. Its policing model has been historically influenced by British and French traditions. Canada is no stranger to terrorism. From Fenians (Whitaker, Kealey and Parnaby, 2013, pp. 19-37) and Sikh extremists (Jiwa, 1986) to the Front de libération du Québec (FLQ) and latterly Islamist extremism, Canada has faced complex threats since inception (Wilner, 2012). 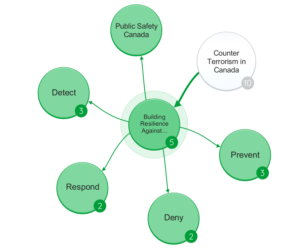 Its present counter-terrorism strategy comprises 4 strands: Prevent, Detect, Deny, Respond (Public Safety Canada, 2013). 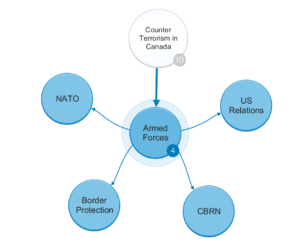 In critically examining the Canadian counter-terrorism policing policy, it is helpful to first outline the scope and objectives of each of these strands. With this context in place, Canada’s policing model (as it pertains to counter-terrorism) can be thematically analysed, strand-by-strand. This necessitates exploring the structure of the Canadian policing model, through municipal, provincial, national and transnational lenses. Low and high policing functions are compared and contrasted, with particular reference to tension points (Brodeur, 2007, p. 4) within and between agencies and policy goals. Effective counter-terrorism involves policing and a multiplicity of agencies, focusing on both domestic and international threats. 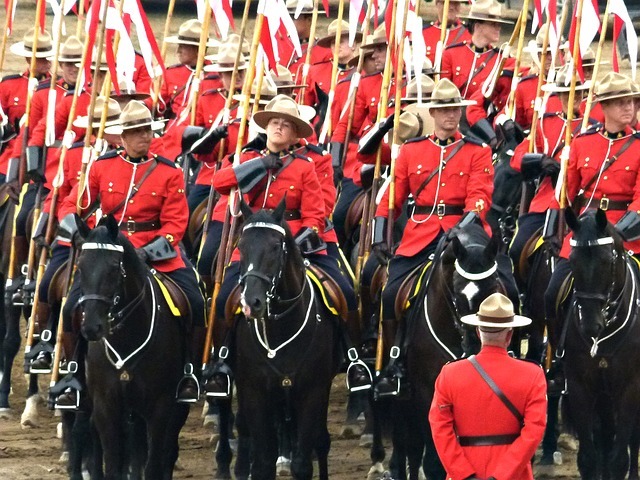 The roles of national and provincial policing are discussed in relation to the Royal Canadian Mounted Police (RCMP), the Sûreté du Québec (SQ) and others. Key agencies such as the Canadian Security Intelligence Service (CSIS), Communications Security Establishment Canada (CSEC), and Canadian Border Services Agency (CBSA) are described. 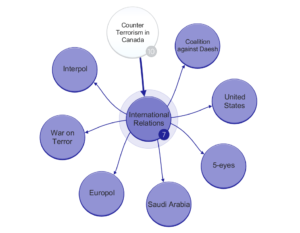 Integrative functions are highlighted within and between tiers of the counter-terrorism policing model. Potential gaps and weaknesses are then discussed along with recommendations for their remediation. 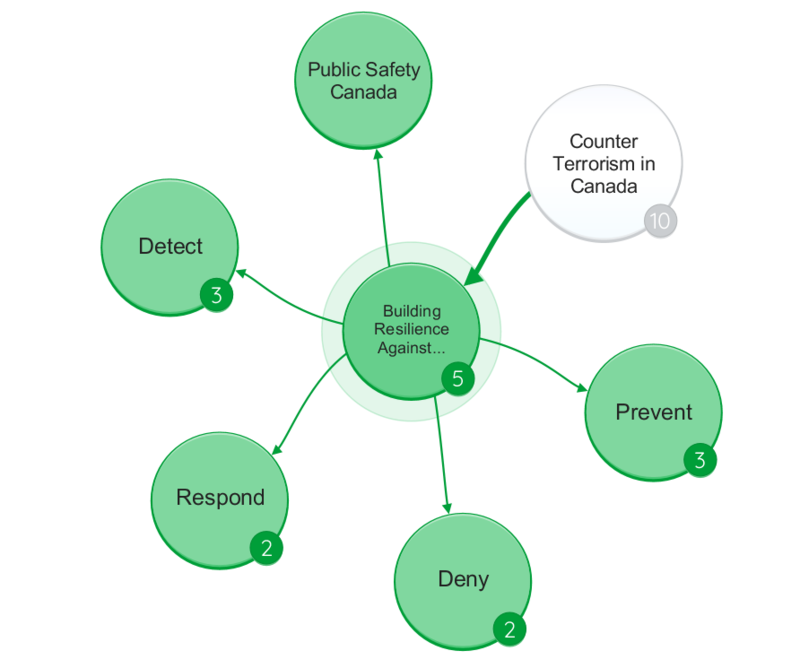 Canada’s counter-terrorism strategy is focused on “building resilience against terrorism” across the 4 strands of Prevent, Detect, Deny and Respond (Public Safety Canada, 2013, pp. 14-30). The Prevent strand (Ibid., pp. 15-17) aims to deter individuals or groups becoming embroiled in supporting or carrying out acts of terrorism. This is achieved through education, counter-radicalisation programmes, community integration and community policing. PREVENT requires detailed understanding of community tensions, shifting demographics and concerns within diasporas (Richards, 2011). Low policing functions (Brodeur, 1983), most particularly community policing are important in developing the trust that elicits flows of criminal and terrorist intelligence (Innes, 2006). 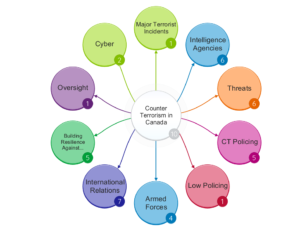 The Cross Cultural Roundtable on Security (CCRS) and the RCMP’s National Security Community outreach programmes are important capabilities in Canada’s countering violent extremism (CVE) toolset. Key challenges in CVE include selecting the right community partners with which to engage and building community confidence, while at the same time not worsening alienation through other activities (such as placing communities under collective suspicion) (Qadir, 2016). The Detect strand (Public Safety Canada, 2013, pp. 17-21) is focused on identification of terrorists, their supporters and evolving plots using a range of law enforcement and intelligence gathering means. In both domestic and international contexts this necessitates a range of capabilities across Signals Intelligence (SIGINT) and Human Intelligence (HUMINT). 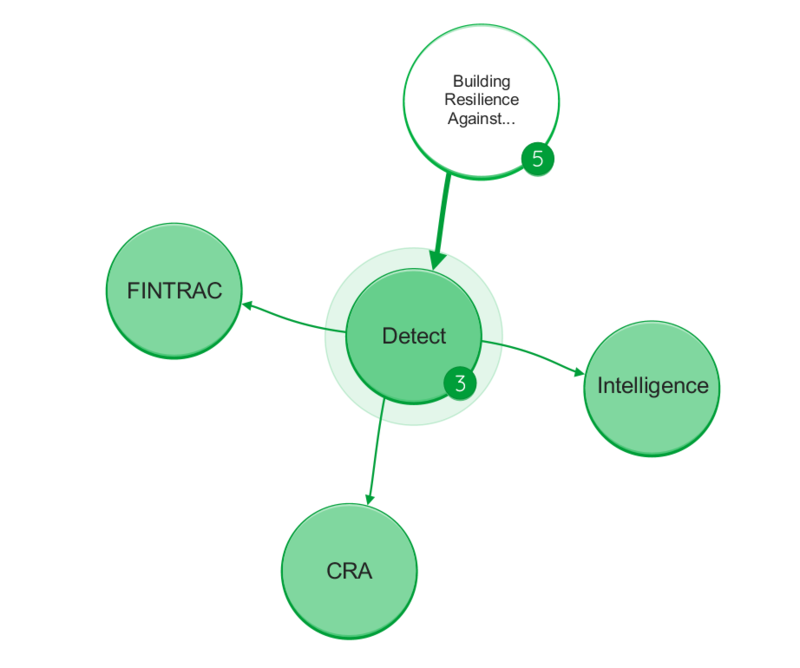 Collection, Analysis and Dissemination of actionable intelligence products is a key requirement. This spans multiple agencies, notably the RCMP, CSIS, CSEC and CBSA. Interrupting the flow of arms, terrorist personnel and finance necessitates a range of specialist capabilities. The Financial Transactions and Reports Analysis Centre (FINTRAC) and the Charities Directorate of the Canada Revenue Agency (CRA) provide important functions in this regard (Ibid., pp. 18-20). Canada’s strategy is to detect and neutralise threats far from its borders. Detection and interdiction of inbound threats, be that personnel, know-how, ideology, funds or weapons is therefore a key focus, alongside countering home-grown threats. Balancing security and privacy is a key concern in intelligence collection in the domestic realm. Ensuring timely dissemination of intelligence to relevant agencies (domestically and internationally) is vital. Tensions between intelligence agencies and law enforcement agencies have been documented (Freeze, 2017). Rivalry, fiefdoms and source protection are common challenges (although perhaps alleviated through the One Vision Framework), as observed in other national security models, notably in the US (9/11 Commission, 2011). The Deny strand (Public Safety Canada, 2013, pp. 21-27) focuses on “means and opportunity”, reducing or eliminating terrorist capabilities and hardening targets against attack in both domestic and international contexts. Threat reduction may be through controlling access to funds, weapons, information, chemicals and even the domestic homeland. 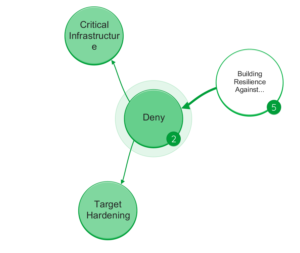 Target hardening includes borders, critical national infrastructure, cyber security and transport networks. Border security necessitates significant cooperation with the US, and Integrated Border Enforcement Teams are one of the mechanisms employed for joint security (Public Safety Canada, no date b). Terrorism prosecutions are important law enforcement contributions to Deny. 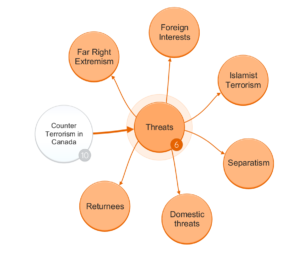 Alongside Canada’s counter-terrorism legal framework, a list of proscribed terrorist organisations sets out key threat groups (Public Safety Canada, no date a). As Islamist terrorism incorporates ‘inspired by’ as well as ‘directed by’ models, low-tech loan-actor terrorism presents significant challenge in the domestic setting. 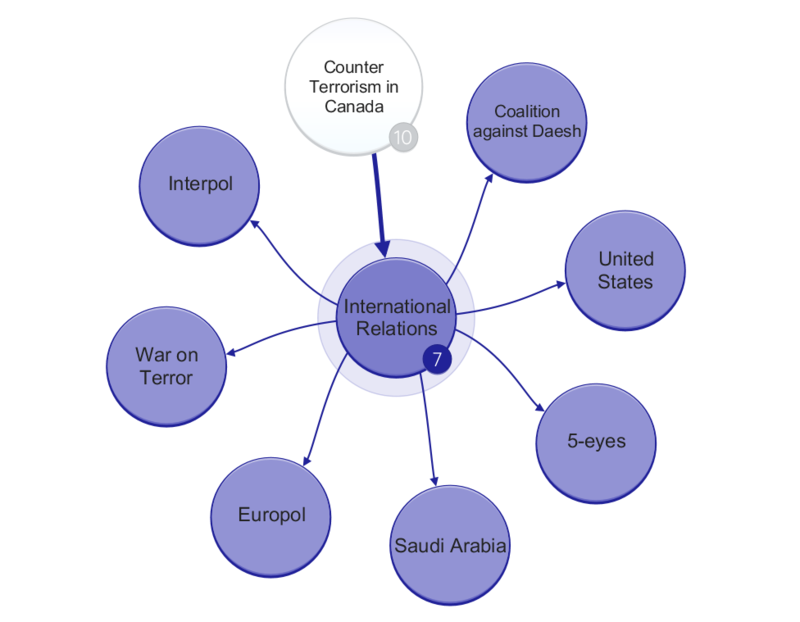 Internationally, Canada is engaged in the Coalition Against Daesh, has been active in combat missions against Al-Qaeda (AQ) in Afghanistan and is involved in a range of stabilisation and international development programmes. These seek to deny terrorists safe havens and potential recruits. 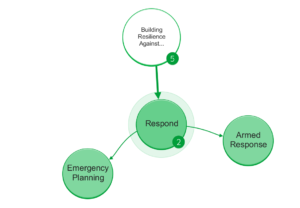 The Respond strand (Public Safety Canada, 2013, pp. 28-30) recognises that some terrorist plots will ‘succeed’. Quickly bringing terrorist incidents to a close with minimal loss of life or damage is therefore a key objective. This may require rapid armed response, emergency service planning and co-ordination across critical infrastructure involving public, private, third sectors and the media. Rapid recovery from a terrorist incident is a key objective. This may include damage repair, decontamination, restoration of services, identification, arrest and prosecution of offenders and community reassurance. Extensive co-ordination and exemplary communication and leadership is essential. Attacks on Canadian citizens and interests abroad must also be considered. This may require joint international investigations, reviewing security and travel advice. Having briefly set out the key aspects of Canada’s counter-terrorism strategy it is next helpful to consider the role of policing and other agencies in its delivery. 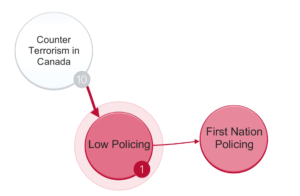 The policing model reflects the historical and political evolution of Canadian society, with its British and French colonial influences. Canada is governed federally from Ottawa, with legislative assemblies across its 10 provinces and three territories. The RCMP operates at all levels as the federal and national police force, as a provincial force with the exclusion of Ontario and Quebec, where the Ontario Provincial Police and SQ are the providers. In Newfoundland and Labrador, provincial policing responsibilities are divided between the RCMP and Royal Newfoundland Constabulary (RNC). The RCMP is the sole policing provider across the Northwest Territories, Nunavut and Yukon. The RCMP also provides municipal policing in multiple regions. Significant municipal policing services are provided by others in major cities. Examples include the Service de police de la Ville de Montréal (SPVM) and the Toronto Police Service. According to Canadian policing statistics (Mazowita and Greenland, 2016), there were 176 municipal police services in Canada in 2015. Canada’s model of indigenous or ‘First Nation’ policing adds additional richness. Low policing delivered by and tailored for indigenous communities is arguably reflective of an inclusive policing approach. Canada does not have a dedicated nuclear police service, although armed response teams are in place to protect nuclear energy sites. The Transit Police play an important role in public transport safety. 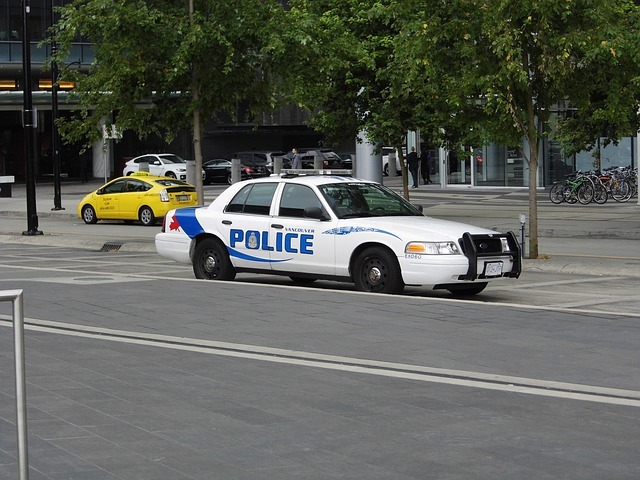 Private National Police Services such as the Canadian National Police Service and the Canadian Pacific Police Service play additional roles in the protection of railway infrastructure. Pluralisation of policing is a significant trend, and policing services are delivered by a range of sworn officers and civilian personnel. Co-ordinating policing functions and intelligence flows throughout the policing model requires dedicated capabilities. 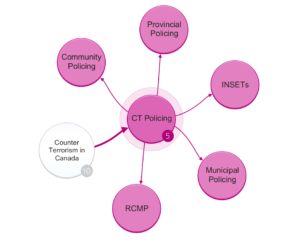 Ensuring coherence across municipal, provincial, federal and transnational policing is non-trivial. The RCMP as the national police service plays a key role in the co-ordination of counter-terrorism response. Integrated National Security Enforcement Teams (INSETs) draw together resources from municipal and provincial policing as well as CSIS and CBSA (RCMP, no date). In some regards they resemble Fusion Centres created by the US Department of Homeland Security after 9/11. At the federal level, further counter-terrorism analysis is provided by the Integrated Terrorism Assessment Centre (ITAC). 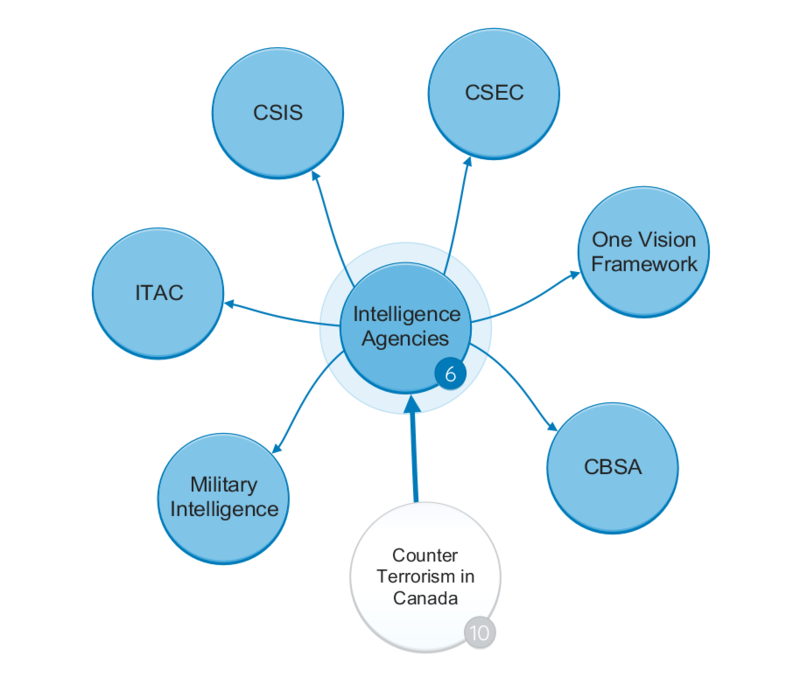 ITAC is multi-agency, but sits within CSIS. Both are scrutinised by the Security Intelligence Review Committee (SIRC). Other important co-ordination functions are provided through Public Safety Canada and the Department of Foreign Affairs and International Trade (DFAIT) by way of the Government and Foreign operation centres. Maritime security is also co-ordinated across the RCMP, CBSA, Canadian Forces (CF) and coastguard using multi-agency Marine Security Operations Centres (MSOCs). In the transnational policing space, the RCMP provides key capabilities and interface points to global partners including Interpol and Europol. Links to NATO and other European agencies are also relevant (Moens, 2012). In the cyber domain, the Canadian Cyber Incident Response Centre (CCIRC) provides national capabilities. In many ways this resembles National Cyber Security Centre capabilities in countries including the UK, Ireland (Department of Communications Energy and Natural Resources, 2015) and Estonia (Retel, 2014). Intelligence collection, analysis and dissemination therefore involves multiple agencies and police services across a complex organisational model. The RCMP, CSIS under the (Canadian Security Intelligence Service Act, 1985), CBSA under the (Canada Border Services Agency Act, 2005) and Transport Canada (under various statutes) are important collection agencies, particularly in the domestic context. CSIS was formed in 1985, although recommendations for its creation date back to 1969. Its early history was chequered and there were tensions with the RCMP, not least over the investigation into the bombing of Air India flight 182. Overlaps between CSIS and RCMP intelligence capabilities must be questioned. The RCMPs ‘iconic image’ has at times been threatened, when associated in the public consciousness with the dark arts of secret intelligence. This was particularly notable in McDonald (1979) Commission Reports. In foreign intelligence, CSEC under the (National Defence Act, 1985) is the primary SIGINT collector. As Canada does not have a dedicated foreign intelligence service (such as America’s CIA or Britain’s MI6), CSIS plays a role in foreign HUMINT (and other intelligence) collection. This lack of domestic and foreign separation (at agency level) arguably complicates its role. Canada’s close alliance with the US, Britain and other members of ‘5-eyes’ (Australia and New Zealand) ensures it benefits from foreign intelligence capabilities of allies (Hanna, 2017). Having explored the counter-terrorism strategy in outline, and the roles of key agencies involved therein, it is next helpful to thematically evaluate its implementation and efficacy, critically assessing gaps and potential weaknesses. The 4 strands, Prevent, Detect, Deny, Respond are therefore revisited identifying key challenges and tensions in delivery of effective counter-terrorism policing policy. 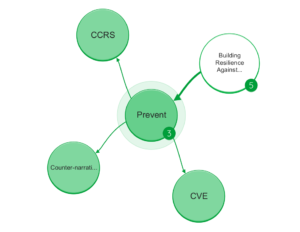 Prevent strategies are notoriously complex to get right. It is important to build excellent community relationships and integrate Prevent programmes across health services, education, community policing and others. There is a risk that the Canadian response could over-concentrate on Sunni Islamist extremism threats. This could exacerbate tensions and lead to over-policing and under-serving certain communities. A focus on far-right extremism, nationalist and separatist extremism, Shia (particularly Hezbollah), populism and ethnic tension must be maintained across CVE initiatives. Diversity within policing is an important indicator of intent and maturity and this generally falls short of the ideal. First Nation policing models are perhaps indicative of certain community oriented policing philosophies. In providing low and high policing functions across Canadian society, the RCMP must maintain a fine balance between community policing, intelligence collection and counter-terrorism. Little is said in the Canadian strategy about reintegration of returnees from conflicts in Iraq and Syria. This is perhaps one of the most complex contemporary counter-terrorism challenges (Public Safety Canada, 2016, p. 3). In this space, there may be opportunity for Canada to explore ideas such as those developed in the Aarhus project (Bertelsen, 2015) in Denmark. Canada’s Prevent strategy should therefore be more expansive, particularly in deradicalization and reintegration of returnees and ensuring focus across the full threat landscape (from far left to far right (Boutilier, 2017), single issue and religious based violence). Effective delivery of Detect requires co-ordination across intelligence agencies and partners in domestic and foreign settings. Threats to Canadian citizens and interests are arguably higher outside of the domestic setting. The role of CF, CSEC and CSIS and the transnational policing capabilities provided by the RCMP are centrally important. There are well-known tensions between intelligence collection and law-enforcement and the overlapping intelligence collection functions of CSIS and the RCMP may further complicate matters. Co-ordinating functions such as INSETs and federal operations centres are likely to alleviate some issues. In working with partner agencies, for example those of the US and Saudi Arabia, Canada must question intelligence sources and methods of intelligence development. 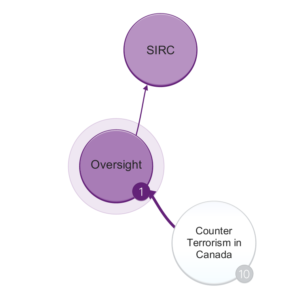 The role of SIRC in scrutinising the work of CSIS introduces important ‘checks and balances’. 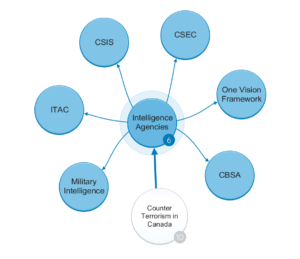 More could be said in the Canadian counter-terrorism strategy about the use of a national intelligence model and supporting technologies and processes. The Deny strand requires effective counter-terrorism legislation and law enforcement in the domestic realm as well as military options in the international realm. The RCMP is lead agency for legal investigation into matters pertaining to national security. Striking the balance between intelligence collection and source protection whilst building criminal cases and associated disclosure of evidence can create tensions between agencies such as the RCMP and CSIS. The Canada Evidence Act and Security of Information Act seek to provide legal frameworks in which such tensions can be resolved, under judicial control (balancing the interests of the state and suspects). The One Vision 2.0 framework between CSIS and the RCMP also codifies principles of effective working practices. Undercover and counter-terrorism policing response under the Deny strand can potentially run contrary to objectives under Prevent and damage police legitimacy. 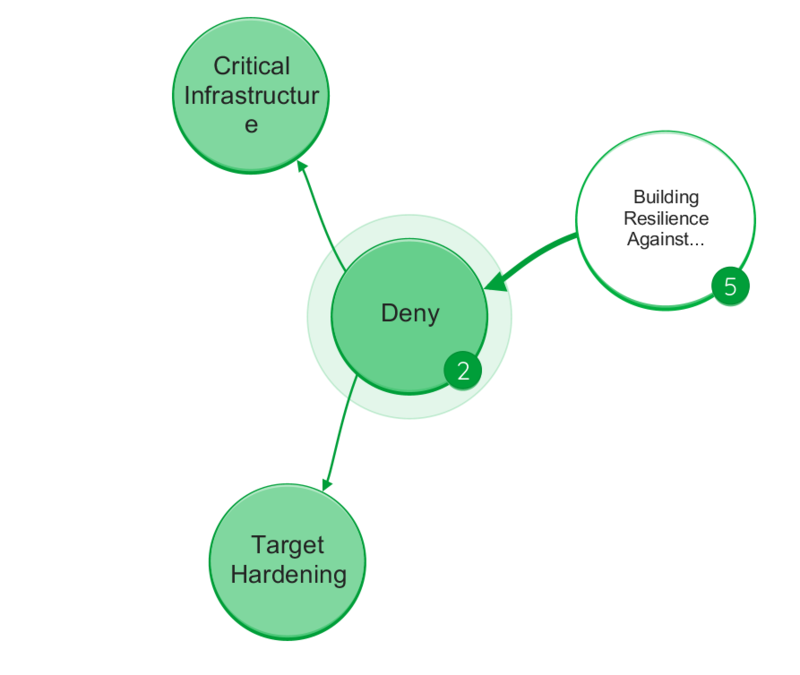 In addition to legal frameworks and investigative responsibilities of RCMP, Deny focuses on target hardening, with Critical National Infrastructure being of importance. 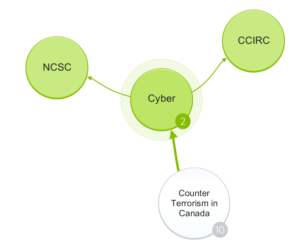 There appears to be some scope to better integrate the National Strategy for Critical Infrastructure (Public Safety Canada, 2009), Canada’s Cyber Security Strategy (Public Safety Canada, 2010) and the over-arching counter-terrorism strategy (Public Safety Canada, 2013), with particular reference to hybrid attack involving cyber and kinetic elements. Canada’s cyber security strategy seems dated and should be reviewed and uplifted to reflect recent and anticipated technological developments. The Respond strand is best assessed through the lens of real-world terrorist incidents. In the domestic setting, Canada’s present climate is arguably highly stable when compared with the October Crisis in Quebec in October 1970 or the aftermath of the bombing of Air India 182 in 1984. That said, the threat from AQ or Daesh inspired or directed attack in the Canadian homeland is significant. Canada is also an obvious ‘launchpad’ from which to plan and attack the mainland US. Canada’s ability to recover from a major terrorist incident seems largely untested, except in simulation and exercise. In the domestic setting, proportionate and measured response to terrorist attack is important so as not to undermine low policing objectives of Prevent. Policing and military counter-terrorism options in the domestic and international settings appear extensive, if perhaps untested at scale in the homeland. It is therefore essential that Prevent, Detect and Deny strands continue as bulwarks and Respond exercising spans an expansive threat spectrum. Canadian society is multicultural and evolving. There are established diasporas and historical connections to British and French colonialism. Immigration from across the world is the new normal, and Canada has given refuge to civilians fleeing the conflict in Syria. Although no stranger to domestic terrorism, separatist and anti-colonial threats have given way to far-right and Islamist extremism. As with other western liberal democracies, Canada feels threatened by home grown as well as foreign extremists who reject Canadian values. In responding to these threats, Canada has adopted a counter-terrorism strategy with significant similarities to that of the UK and Australia. Canada’s national security is somewhat bound to that of the US. Bilateral agreements and cooperation, particularly in relation to border security is apparent. 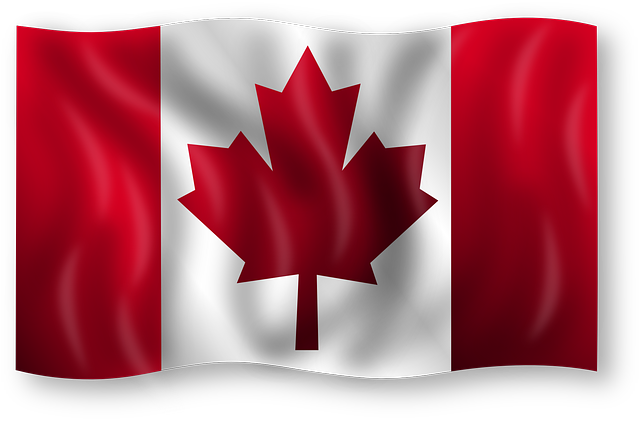 Canada is integrated with other transnational organisations including the United Nations, NATO, Interpol and Europol. Canadian forces have been active in the conflict against AQ in Afghanistan and in the Global Coalition against Daesh. Exacerbation of domestic community tensions may be linked to some expeditionary military activities. The founding of CSIS in 1985 makes an interesting case study in the creation of an intelligence service and the associated tensions with its ‘perhaps reluctant surrogate’, the RCMP. With the RCMP taking lead policing role for national security, its role in intelligence collection and overlap with CSIS must be considered. Intelligence and investigation failures into the bombing of Air India 182 provide important lessons. These may well have strengthened the organisational effectiveness of Canadian counter-terrorism in the decades following. We really hope you found our article on Counter Terrorism Policing Strategy in Canada useful and enjoyable. Please consider sharing it on your favourite social media channels. This helps us out a lot and we really do appreciate your time and consideration. We have lots of great content on our SINS Blog (Strategy, Innovation & National Security). Please also check it out, subscribe and share the feed. If you are a member of the press, media commentator or analyst and would like original quotes or material for your own pieces, please check out our Expert Source page, which gives more information about our experience helping the media, industry analysts and conference organisers. We really look forward to hearing from you. Disclosure of Material Connection: Some of the links in the body of this post and in the bibliography are Amazon “affiliate links.” This means if you click on the link and purchase the book, we will receive an affiliate commission. Regardless, we only recommend books that informed our research and which we genuinely believe will add value to our readers. 9/11 Commission (2011) The 9/11 Commission report : the attack from planning to aftermath : authorized text. New York: W.W. Norton & Co.
Bertelsen, P. (2015) ‘The Aarhus Model: Principles and Organization’, Panorama, Insights into Asian and European Affairs, (From the Desert to World Cities, The New Terrorism), pp. 241–253. Available at: http://psy.au.dk/fileadmin/Psykologi/Forskning/Preben_Bertelsen/Avisartikler_radikalisering/Panorama.pdf. Boutilier, A. (2017) Right-wing extremism ‘growing concern’ in Canada, federal report says, Toronto Star. Available at: https://www.thestar.com/news/canada/2017/12/21/right-wing-extremism-growing-concern-in-canada-federal-report-says.html. Brodeur, J.-P. (1983) ‘High Policing and Low Policing : Remarks about the Policing of Political Activities’, Social Problems, 30(5), pp. 507–520. Available at: http://www.jstor.org/stable/800268. Brodeur, J.-P. (2007) ‘High and Low Policing in Post-9 / 11 Times’, Policing: An International Journal of Police Strategies & Management, pp. 25–37. doi: 10.1093/policing/pam002. Canada Border Services Agency Act (2005). Canada. Available at: http://laws-lois.justice.gc.ca/PDF/C-1.4.pdf. Canadian Security Intelligence Service Act (1985). Canada. Available at: http://laws.justice.gc.ca/PDF/C-23.pdf. Department of Communications Energy and Natural Resources (2015) National Cyber Security Strategy 2015-2017. Available at: http://www.dcenr.gov.ie/communications/SiteCollectionDocuments/Internet-Policy/NationalCyberSecurityStrategy20152017.pdf. Freeze, C. (2017) Concerns over Bill C-51 prompt CSIS to brief other agencies on operations, The Globe and Mail. Available at: https://www.theglobeandmail.com/news/national/concerns-over-bill-c-51-prompts-csis-to-brief-other-agencies-on-operations/article31788063/. Hanna, J. (2017) What is the Five Eyes intelligence pact?, CNN. Available at: http://edition.cnn.com/2017/05/25/world/uk-us-five-eyes-intelligence-explainer/index.html. Innes, M. (2006) ‘Policing Uncertainty: Countering Terror through Community Intelligence and Democratic Policing’, The ANNALS of the American Academy of Political and Social Science, 605(1), pp. 222–241. doi: 10.1177/0002716206287118. Jiwa, S. (1986) The death of Air India flight 182. Paperback Division of W.H. Allen & Co.
Mazowita, B. and Greenland, J. 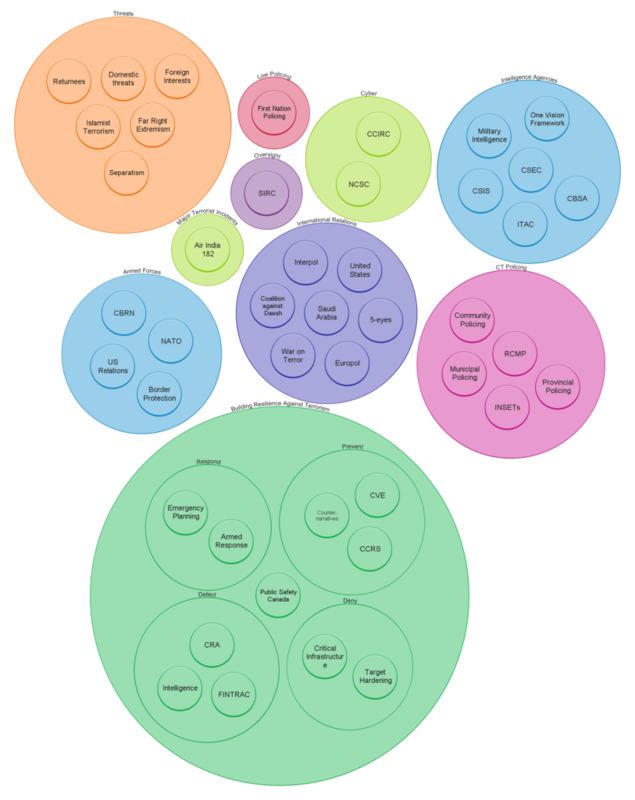 (2016) Police resources in Canada, 2015, Statistics Canada. Available at: https://www.statcan.gc.ca/pub/85-002-x/2016001/article/14323-eng.htm. McDonald, D. C. (1979) Commission of Inquiry Concerning Certain Activities of the Royal Canadian Mounted Police. Available at: http://epe.lac-bac.gc.ca/100/200/301/pco-bcp/commissions-ef/mcdonald1979-81-eng/mcdonald1979-81-report1/mcdonald1979-81-report1-eng.pdf. Moens, A. (2012) ‘NATO and the EU: Canada’s Security Interests in Europe and Beyond’, in McDonough, D. S. (ed.) Canada’s National Security in the Post-9/11 World – Strategy, Interests and Threats. University of Toronto Press, pp. 141–159. National Defence Act (1985). Canada. Available at: http://laws-lois.justice.gc.ca/PDF/N-5.pdf. Public Safety Canada (2009) National Strategy for Critical Infrastructure. Available at: https://www.publicsafety.gc.ca/cnt/rsrcs/pblctns/srtg-crtcl-nfrstrctr/srtg-crtcl-nfrstrctr-eng.pdf. Public Safety Canada (2010) Canada’s Cyber Security Strategy. Available at: https://www.publicsafety.gc.ca/cnt/rsrcs/pblctns/cbr-scrt-strtgy/cbr-scrt-strtgy-eng.pdf. Public Safety Canada (2013) Building Resilience Against Terrorism – Canada’s Counter-terrorism Strategy. Available at: https://www.publicsafety.gc.ca/cnt/rsrcs/pblctns/rslnc-gnst-trrrsm/rslnc-gnst-trrrsm-eng.pdf. Public Safety Canada (2016) 2016 Public Report on the Terrorist Threat to Canada. Available at: https://www.publicsafety.gc.ca/cnt/rsrcs/pblctns/2016-pblc-rpr-trrrst-thrt/2016-pblc-rpr-trrrst-thrt-en.pdf. Public Safety Canada (no date a) Currently listed entities. Available at: https://www.publicsafety.gc.ca/cnt/ntnl-scrt/cntr-trrrsm/lstd-ntts/crrnt-lstd-ntts-en.aspx. Public Safety Canada (no date b) Integrated Border Enforcement Teams. Available at: https://www.publicsafety.gc.ca/cnt/brdr-strtgs/brdr-lw-nfrcmnt/ntgrtd-brdr-nforcmnt-tms-en.aspx. Qadir, H. (2016) Preventing & Countering Extremism & Terrorist Recruitment: A Best Practice Guide. John Catt Educational Ltd.
RCMP (no date) Integrated National Security Enforcement Teams. Available at: http://www.rcmp-grc.gc.ca/secur/insets-eisn-eng.htm. Retel, S. (2014) Estonia’s Cyber Security Strategy (2014-2017). Available at: https://www.mkm.ee/sites/default/files/cyber_security_strategy_2014-2017_public_version.pdf. Richards, A. (2011) ‘The problem with “radicalization”: The remit of “Prevent” and the need to refocus on terrorism in the UK’, International Affairs, 87(1), pp. 143–152. doi: 10.1111/j.1468-2346.2011.00964.x. Whitaker, R., Kealey, G. S. and Parnaby, A. (2013) Secret Service: Political Policing in Canada from the Fenians to Fortress America. University of Toronto Press. Wilner, A. S. (2012) ‘Counter-Capability and Counter-Motivation: A Counterterrorism Strategy for Canada’, in McDonough, D. S. (ed.) Canada’s National Security in the Post-9/11 World – Strategy, Interests and Threats. Toronto: University of Toronto Press, pp. 269–288.